Posted on October 12, 2009 by Alicia Bay Laurel	in Blog. In spring 2008, Kurkku hosted the first of what became four art shows of the original drawings and page layouts of Living on the Earth. I was delighted to hear that Banana-san had purchased my self-portrait that appears on the epilogue page of the book. She’s 15 years younger than I am, and the book was a favorite of her childhood. So, she said, she felt almost in a dream to purchase this drawing she had gazed upon so long ago. Fujii-san, a rock and roll producer who is a friend of Banana-san’s and a friend of Keisuke Era’s (he’s the director at Kurkku) offered to introduce me and Banana-san, and Switch Magazine offered to document this event. 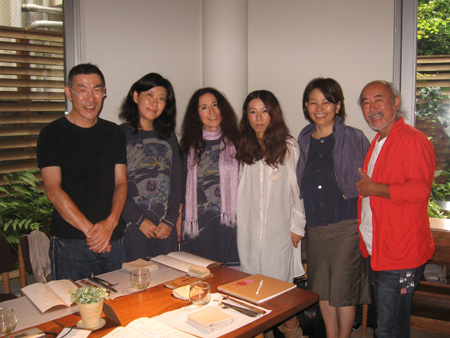 So, here we are: Takeshi Fujii, Banana Yoshimoto, me, Miho Kawaguchi (writing for Switch), Kaori Miyagi (translating for me) and Kengo Tarumi (taking photos for Switch). OMG! We showed up wearing the SAME EXACT T-SHIRT! It’s the Being of the Sun illustration licensed by Aya Noguchi (fashion designer and owner of Bed and Balcony) last year for her summer line. But that wasn’t the only coincidence. After the interview was over, Banana went out to the street and there stood our dear friend in common – Sandii Manumele, vocalist extraordinaire and hula teacher of hundreds of Tokyo students, including Banana. Sandii rushed upstairs to see me and we had a big group hug. I last saw Sandii at a huge rock concert memorial for Donto in Okinawa City in 2006. She danced and sang in the show, and I sang one of my songs, too. We became instant friends. Sandii choreographed the hula for Donto’s classic song “Nami,” which women all over Japan love to dance. I just recorded “Nami” on my recent CD, Beyond Living, both in the original Japanese lyrics, and also in a Hawaiian and English translation. 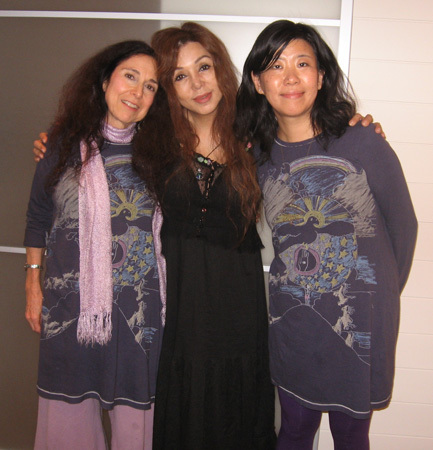 I was happy to present both Sandii and Banana with signed copies of my new CD. Here‘s Banana-san’s blog about the same meeting (in Japanese).